Boy must be bored today thinking up bizarre turns of fate but all of the following is real. 0600hrs: we want to start early so as to take advantage of the NE Monsoon that blows here up until 1330hrs. 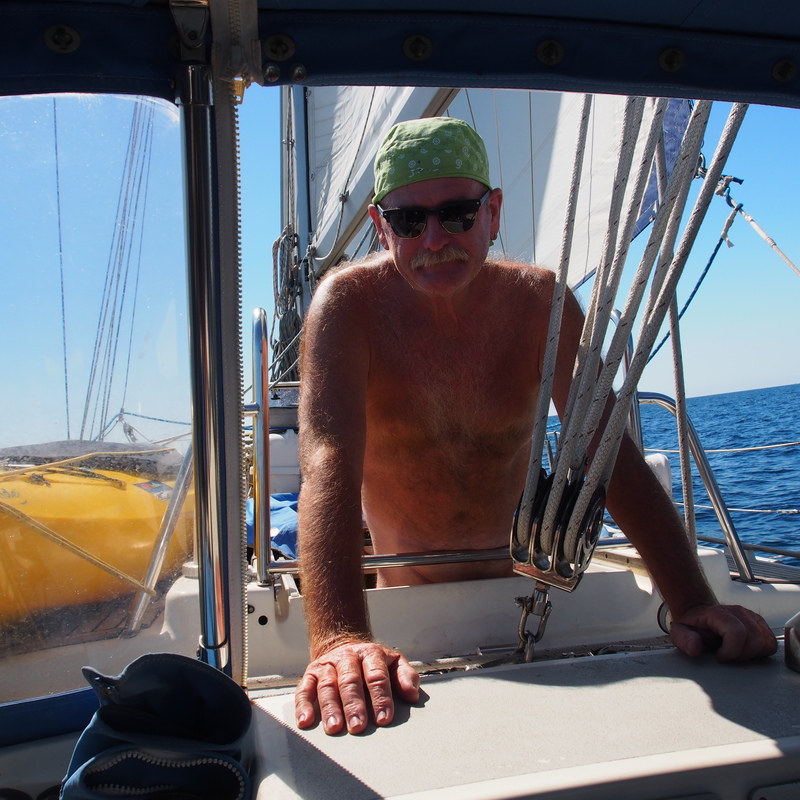 So, we stagger out of the forward berth put on the tea kettle and start to put things away down below getting ready for a rough ride to windward as of course we want to head to Ko Pi Pi which is eastward and that is where the wind is blowing from. 0700hrs: Breakfast of yoghurt and granola with tea is finished so it is time to get going. We have not started the engine as the wind is strong enough in the protected anchorage to enable us to avoid the other anchored boats once set free. Connie has hauled up the anchor and is putting the foredeck into order whilst the boat slave is back at the wheel and setting the jib in order to sail out of the anchorage. I always love sailing up the anchor. 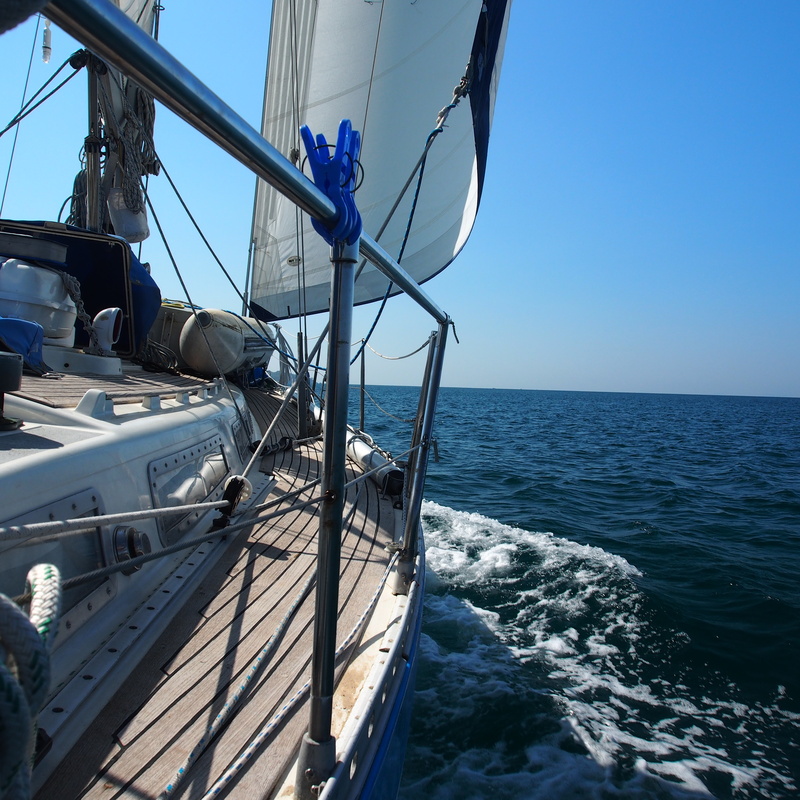 The boat starts to move slowly with the light wind in a protected anchorage, the boat glides slowly through the calm water slowly picking up enough speed to have steerage. Sure of release the boat picks up speed as more sail is added, the protection of land is left behind and one enters open water. This morning is no exception except the wind is stronger than first thought and the bow rises to meet the swell and the first cascade of water flies up in the air, over the bow and cascades down the deck. 0800hrs: ah yes, the water swooshes along the deck and we suddenly look at each other and have the same question on our minds “did you dog down the hatches forward?”. I guiltly say no and proceed down below to find the forward berth covered in salt water and the salt water sloshing back and forth on the floor of the head i.e. Bathroom. No one wants salt water on the bed. It is impossible to keep dry afterwards in this climate. So tear off all the bedding, call up to Constance on deck, “everything is fine!” and keep cleaning up while the boat rises to the waves and crashes into the following wave with the resulting rush of water down the side deck. So much for a lovely and easy sail across to Kho Pi Pi. 0900hrs: I have not had my coffee yet. Head down below, wrap the galley belt around me to keep me in place, balance the espresso maker on the stove, don’t spill the fine coffee all over the counter, encourage the gecko to come out of hiding because I still see the odd cockroach, light the stove and stand waiting for the elixir to bubble up to the top of the coffee maker. Now comes the hard part. Maneuver my way back to the cockpit with a hot cup of coffee in hand without spilling any. Ah, success. And what sweet success. Snuggle myself into a comfortable corner of the cockpit and sip my coffee while Sage plows her way to windward and her days destination. 1100hrs: Wind is lightening, getting more finicky by changing direction 20-30 degrees every five minutes making it more of a challenge to strategize on the best way to get us to the next anchorage. We sit back, marvel at the incredibly clear views we have today clearly seeing both Ko Lanta in the distance and Buddha high on top overlooking Phuket. We are going to miss Buddha as we are headed to the land of minarets and the 0500hr call to prayer from the Malaysian minarets. 1300hrs: Darn, the wind is down to 5 knots and we are moving through the water at 3 knots. The water is no longer cascading over the bow but we are also not making a great deal of headway. Kho Pi Pi still seems a long way off but in reality it is only 12 miles away. Discussions begin on whether or not to start the engine. 1400hrs: Damn, the engine has been started, clothes stripped off, buckets of water thrown over the decks and ourselves and progress is being made albeit slowly. 1600hrs: Motoring in. What a zoo. 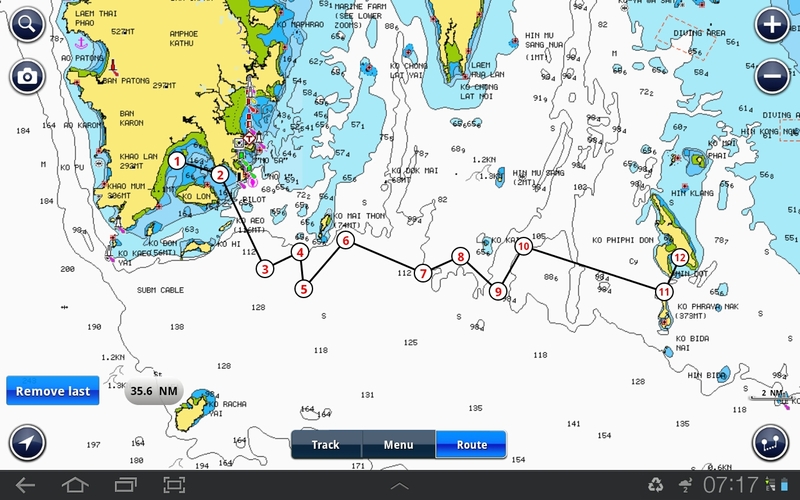 Anchorage is deep and discussions about where to anchor brings a heated debate. 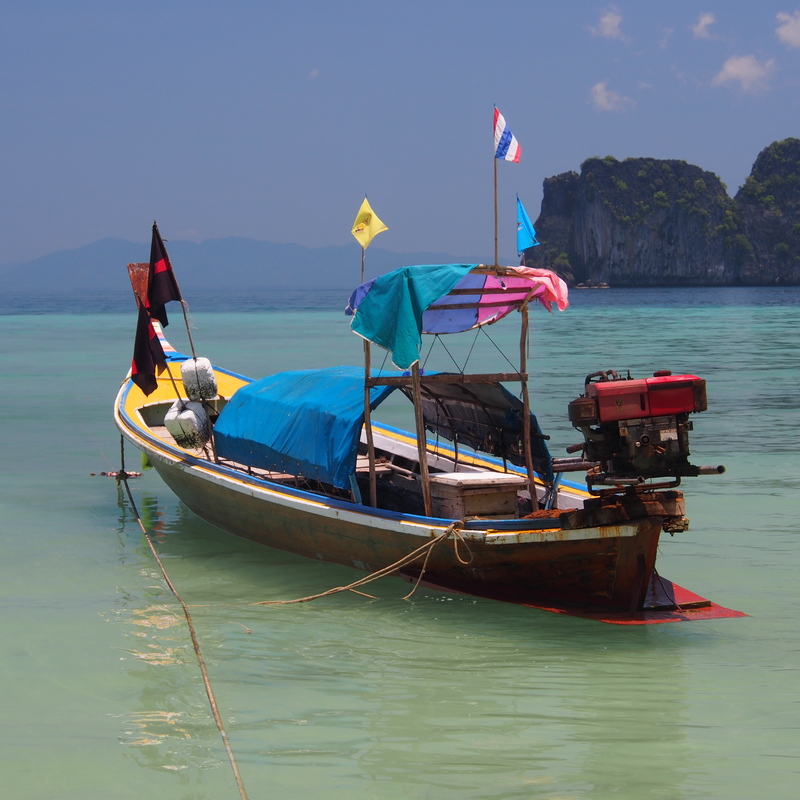 There are numerous mooring buoys with a multitude of commercial tourist boats coming and going. We choose to take one of the many mooring buoys just not sure if we are going to get thrown off by someone claiming it to be theirs. Final log entry for the day shows we travelled 39.9 miles to cover a straight line distance of 28.8. Seems crazy to think we had to tack that much yet we enjoyed the sail. Sadomasochistic? Perhaps. 1900hrs: Launching the dinghy to go ashore. Before doing so it has to be cleaned up from two weeks of previous use. Plenty of sand and grit on the inside and numerous barnacles starting to grow on the bottom. Only cleaning water is salt so by the end of cleaning and in this heat feel like a salt encrusted sponge that combines with the sweaty exertions of pulling, brushing, cleaning and launching the dinghy. Dying for a half hour continuous shower. However, Pi Pi has not had rain in 6 weeks so there is not much fresh water around except that which we carry with us. 2000hrs: We are ashore wandering the back alleys wondering which little restaurant may conjure up something tasty and satisfying and at the same time have some fans to move the still night air. Success, we found Anna’s. Not great but it is hard to get a bad meal in Thailand, unlike Malaysia. 2130hrs: Back on the beach. The tide is out and the dinghy is still there. We are always worried about losing the dinghy. It is the equivalent of our car. It gets us back and forth to shore so without it we would have to swim. 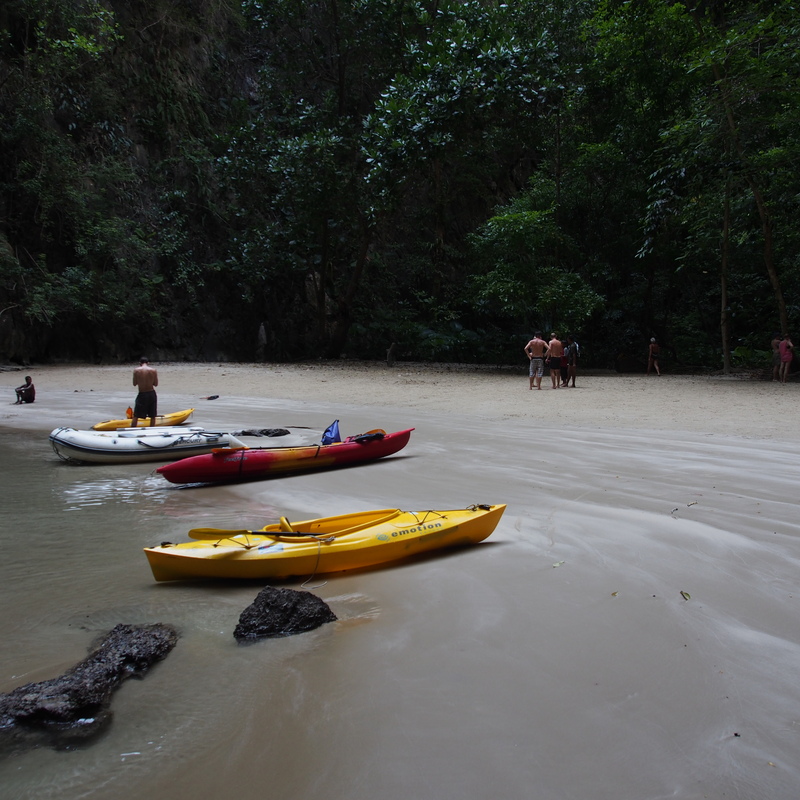 Carrying a bag of groceries and several containers of water would present a problem were we having to swim. We drag the dinghy back to the water and row through the anchored boats cursing ourselves for not having brought a light so that the local boats do not run us over as we wend our way back to Sage. 2200hrs: We are back onboard and finally hauling out the shower. It is dark, hopefully no one watching, the wind non-existent, still hot and humid and we are ready. Oh, does that feel good. It is not a long shower but the days salt and sweat is quickly rinsed down the deck and there is a slight breeze providing a cooling and refreshing feeling before heading to bed. But, we are still concerned someone is coming to claim their mooring. 2359hrs: No I am not kidding. Antonio has fallen asleep in the cockpit with no clothes on. Suddenly lights are beamed into the cockpit, someone yelling it is their mooring and telling us to move on. Stunned and groggy I reach for a towel, stagger to the engine start button, call Constance and proceed to unleash ourselves. It is dangerous in this anchorage at night. 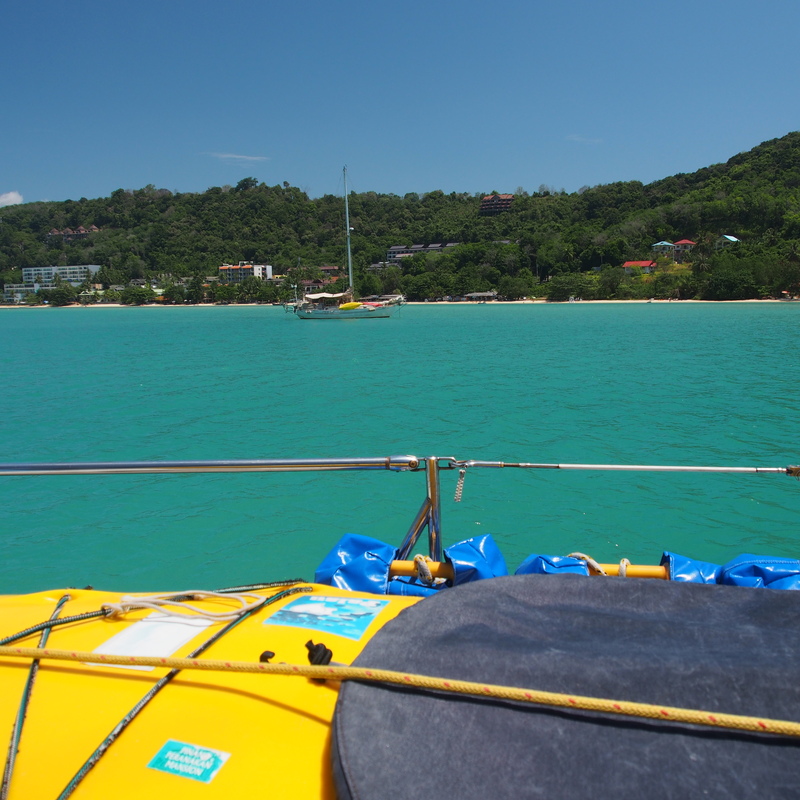 There are all sorts of moorings with floating lines to snag unsuspecting propellers so we head out to open water and…. That’s our 24 hours. How is yours? I wore clothing for openers….. Great story you guys. Tell us more! I always enjoy reading stories from Sage. Good work, good stories – keep them coming. Great story! Wishing you fair winds and calm seas.